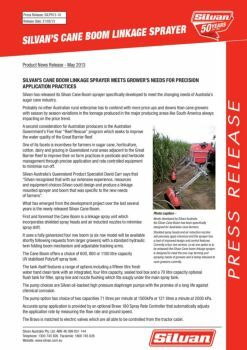 The Silvan Cane Boom is designed specifically for Australian cane growers. It incorporates shielded spray heads and air inducted nozzles to minimise spray drift. The fully galvanised 4 row boom comes standard with a hydraulic twin folding ram mechanism and adjustable tracking arms. The Cane Boom offers a choice of 600, 800 or 1100 litre capacity UV stabilised Polytuff spray tank. The tank itself features a range of options including a fifteen litre fresh water hand clean tank with an integrated, four litre capacity, sealed tool box and a 70 litre capacity optional flush tank for filter, spray line and nozzle flushing which fits snugly under the main spray tank. Accurate spray application is provided by an optional Bravo 180 Spray Rate Controller that automatically adjusts the application rate by measuring the flow rate and ground speed. The Bravo is matched to electric valves which are all able to be controlled from the tractor cabin. The boom design incorporating the vertical channel of the spray tank assembly allows a manual boom height adjustment or an optional hydraulic boom lift. 600, 800 or 1100L UV stabilised polytuff tank. 500 - 1800mm spray head with brush skirts. 2 x twin nozzle bodies per head with air induction nozzles. The fully galvanised 4 row boom comes standard with a hydraulic twin folding ram mechanism & adjustable tracking arms.